Data acquisition and process control go hand in hand. Regulating process variables and documenting process performance are mainstays of efficiency and performance. The acquisition, recording, displaying, and control functions can be accomplished with separate independent devices, but some application instances are better served by an integrated device that combines all the control, display, and data acquisition functions into a single compact device. Eurotherm, a globally recognized manufacturer of data acquisition, recording, and control gear, combines all of these functions and more into a very capable recorder/controller. The nanodac incorporates an extensive array of input, output, recording, communicating, display, and control capabilities. It is well suited for small processes or process segments, as well as being a good candidate as a packaged operator interface, recorder, controller for OEM equipment. I have included a data sheet for the nanodac below. Survey the datasheet to familiarize yourself with the full extent of this process controller/recorder's capabilities. It is all housed in a compact 1/4 DIN unit with a NEMA 12 (IP65) front face and a slim 3.54" (90 mm) extension behind the front panel. Share your data acquisition, control, and recording challenges with a product application specialist. Combine your process knowledge with their product application expertise to develop the most effective solutions. 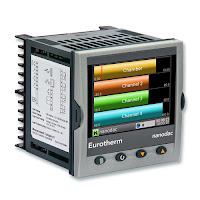 Eurotherm nanodac recorder controller datasheet from Hile Controls of Alabama, Inc.